In-office Whitening: Same-day laser whitening brightens your teeth by several shades in just one appointment. In-office treatments are idea for people with busy lifestyles or upcoming events when you need to look your best. Take-home Whitening Trays: Conveniently whiten your teeth in the comfort of your own home. These custom fit trays hold our professional grade gel against your teeth and can be worn day or night. See full results in 10-14 days. Both types of whitening treatments are extremely effective; the one you choose usually depends on how soon you want to see results and your personal preferences. Tooth enamel naturally darkens over time, making our smile look older and more aged. Professional whitening is an efficient way to make your teeth look brighter, healthier and younger. When you feel confident about the way they look, you’ll feel comfortable smiling around the people you spend life with. Professional products like the ones we use in our practice are both safe and effective. They work more efficiently and are gentler than kits that can be purchased over the counter. 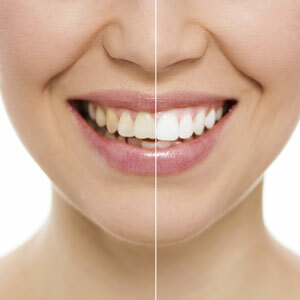 Our professional teeth whitening treatments are more affordable than you may have thought. They’re a great gift for yourself or your teen. You can even whiten to enhance the results of other services like Invisalign® or before cosmetic bonding. Schedule a consultation today to learn more. Same-day appointments are available!